I start with a Kiwi Kiss base and layer Not Quite Navy on top. The Rockabilly DSP is gorgeous so it's a no brainer to use it & for a bit of detail; I use the Eyelet Border punch before layering it on top of my NQN cs. There's 4 more layers (I'm a layer freak too) of NQN, Kiwi Kiss, Blush Blossom & Whisper White which I scallop again after stamping my flower from Soft Summer (yes, I got new rubbah on Friday!!!) 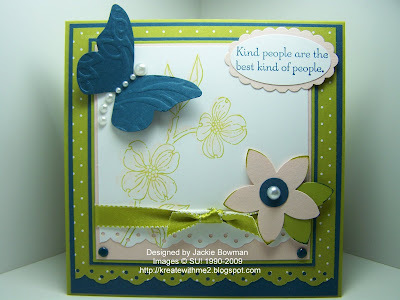 I use my fave Butterfly die and emboss it with a texture plate--love those things too!! Even after embossing him, he still looks sort of plain so to jazz him up a bit, I gave him a pearl body, tail & head....looks much better now! I stamp my sentiment in NQN, punch it out with my large oval punch & layer it on top of the new scallop oval punch---it's fast becoming my fave too LOL!!! I sit back and look at my card for a bit....needs something I said; I add the Kiwi Kiss Satin Ribbon---needs just a bit more...there's white space that's freakin' me out so I punch 2 flowers, a circle & add a pearl. Dang...too plain so I give it a few swipes across the NQN & KK ink pads. LOVE IT so I attach it with some dimensionals. Ugh, the bottom corners are plain so I better add some brads....VOILA!! I'm finally happy with it but alas, it's another heavy card!!! There, so now you know what I go through each & every time I attempt to make a card/project. Hope I didn't scare anyone away....I'm actually pretty normal outside of my creative process LOL!! Well, I better get moving here....kiddos have to get ready for school! Thanks so much for stopping by and have a great rest of the day! This is beautiful. Great use of colors and that butterfly is great. Not sure about Blush Blossom but love what you did with it. If I couldn't relate - it sounds worse than it really is! But then, it takes time to create such beauty! Love that butterfly! Can I ask what die is it? Wow Jackie! Great color combo. I love your card! You used the color combo so well, Jackie! Wonderful card! I like how you did the pearls with the butterfly!! very pretty card Jackie, and love the color combo on here :) great job!!!! I love what you've done here-I am lovin' that new scallop oval punch too! Thanks for playing along with us again! Gorgeous card, I love the way you use ribbon and stamps, it is great to look at. This is very pretty! That's pretty much how my mind works, too! Love the texture on the butterfly! You go through that too:). Well this came out beautiful. I love what you did with that butterfly, very pretty. Now enough of resting let's get busy cleaning that lawn :). soooo pretty Jackie-I love how you did the pearls coming off the butterfly! This is adorable Jackie! Love it!!! Hi Jacquel, Just added you to my blog as a fellow Splitcoast Sister! I already visit you quite regularly, but now you will always be on my weekly visiting list! Love that card, you have used so many different elements. What a sweet card!!! Love what you did with the colors! Thanks for playing the Throwdown--hope to see you back next time! Hey Jackie! Your work is beautiful! I am from the SCS SU Bloggers group. Looking forward to getting to know you! everytime I come to your blog I am in awe...great job!! Omgosh, how very beautiful, Jackie!! I love all the cc, how you added the delicate pearls and your floral line images on the white panel..oh, and the punched border along the bottom looks fabulous too! This is one stunner of a card(duh! YOU made it!) and I'm glad to hear you got a nice nap this weekend--you know as well as I do that the yardwork will still be there waiting for ya, hehe! :) hugs and tfs! Beautiful card! I love the flower in the corner and love your use of this weeks colours over at CTD blog. Just beautiful, love the butterflies! oh i love this card., the die cut is so beautiful! Wow Jackie there is alot going on in this card and it comes together great! Love the pearls on the butterfly. Beautiful and sooo many layers! I really need to step out and make some square cards-I am really in a rut. Love how you inked the flower! This is an awesome card! I LOVE that color combination! You did a great job here! TFS! Oh, wow! It's beautiful!! Thanks for playing with us again this week!!! I love your website! The pearls on the butterfly are such a cool idea and I like how it is embossed. Just beautiful! Love the pearl accents on the butterfly, and all of the lovely layers! I love how you made the butterfly. The pearls and the embossing are an awesome touch. I have the soft summer set coming in the mail and I can not wait to play with it. This is so pretty! I love how you did the butterfly. I might have to try that! Jackie this is so pretty! I really love that butterfly! Jackie this card is so pretty!!! I love the papers you choose and that punch is so versitile, and I love the Butterfly!!! Wow! Totally gorgeous! Love the colors, pearls, and beautiful butterfly!